The Time’s third album, which again saw all tracks written by Prince (as Jamie Starr) – done during the 1999 Tour – but credited to Morris Day. 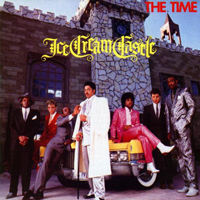 Ice Cream Castle is the band’s first album to contain a song (The Bird) actually performed by The Time itself, hitherto all instruments were mainly performed by Prince. The album accompanied Prince’s own soundtrack to the movie Purple Rain in which The Time is portrayed as The Kid’s (Prince) musical foil, it is certified Gold by the RIAA. Morris Day left The Time following an acrimonious fallout with Prince, with this and other disagreements The Time disbanded. A spin-off Prince project The Family with three of The Time’s band members was subsequently created. Prince’s production credit for Ice Cream Castle under the name of Jamie Starr (The Starr ★ Company).